I have read books on female suffering and endurance; the ones forced on me in school and the ones I read voluntarily. Not even from Chimamanda's The Purple Hibiscus did I get such a vivid portrait of this menace. 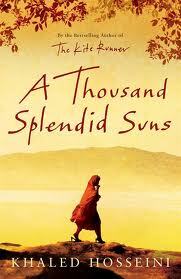 Khaled Hosseini took me to the world of the Afghan woman's survival in the war-ravaged country. A must read for all book lovers. I grew up watching the Indian Movies, but I lost interest in them mainly because of the length, really 3hours of my time, watching some lovers sing, fight and all the normal scenes they portray was a waste of time for me. Last weekend, I finally decided to follow my flatmates to the cinema to watch Delhi Belly only because they said it was all the in English. Delhi Belly: I have never laughed this hard watching any Indian movie. This is one non-pretentious movie which portrayed the present day India. Kate Voegele is out with another album, Gravity Happens... I love love her and favorite so far is Heart in chains and the album title itself, Gravity happens. The book sounds interesting. I'll add it to my to-read list. Never heard of Kate Voegele before. Lol... yeah, I don't really keep up with current music and trends :-P. But I liked what I heard. I'll look her up on YT and google. Well this is a different side to you i haven't seen b4...i.e the music n ish....I like! ATSS was my fav book of 2010, I cried so much. It was sure an eye opener. Awww Aamir Khan..love him! he is so cute and talented. you should watch 3 idiots! That book sounds like a must read..2 more months then I 'll be free to pursue novels. Wow! I just gave away 'a thousand splendid suns' (which was given to me as a present last xmas)- cos I have not had the time to read it (only reading African lit for now) and it was just gathering dust. I hope the recipient enjoys it as much as you did.